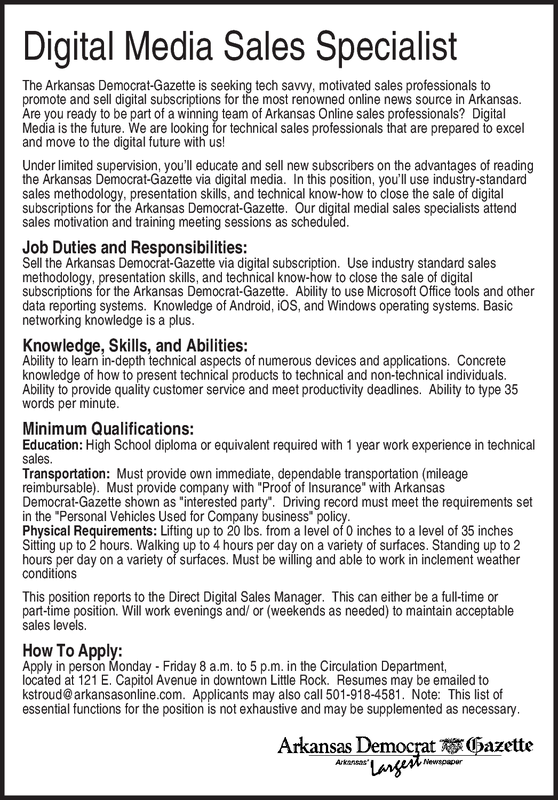 The Arkansas Democrat-Gazette is seeking tech savvy, motivated sales professionals to promote and sell digital subscriptions for the most renowned online news source in Arkansas. Are you ready to be part of a winning team of Arkansas Online sales professionals? Digital Media is the future. We are looking for technical sales professionals that are prepared to excel and move to the digital future with us! Under limited supervision, you'll educate and sell new subscribers on the advantages of reading the Arkansas Democrat-Gazette via digital media. In this position, you'll use industry-standard sales methodology, presentation skills, and technical know-how to close the sale of digital subscriptions for the Arkansas Democrat-Gazette. Our digital medial sales specialists attend sales motivation and training meeting sessions as scheduled. Sell the Arkansas Democrat-Gazette via digital subscription. Use industry standard sales methodology, presentation skills, and technical know-how to close the sale of digital subscriptions for the Arkansas Democrat-Gazette. Ability to use Microsoft Office tools and other data reporting systems. Knowledge of Android, iOS, and Windows operating systems. Basic networking knowledge is a plus. Ability to learn in-depth technical aspects of numerous devices and applications. Concrete knowledge of how to present technical products to technical and non-technical individuals. Ability to provide quality customer service and meet productivity deadlines. Ability to type 35 words per minute. Education: High School diploma or equivalent required with 1 year work experience in technical sales. This position reports to the Direct Digital Sales Manager. This can either be a full-time or part-time position. Will work evenings and/ or (weekends as needed) to maintain acceptable sales levels. Apply in person Monday - Friday 8 a.m. to 5 p.m. in the Circulation Department, located at 121 E. Capitol Avenue in downtown Little Rock. Resumes may be emailed to kstroud@arkansasonline.com. Applicants may also call 501-918-4581. Note: This list of essential functions for the position is not exhaustive and may be supplemented as necessary.